See all Monet art prints. Often modeling for her husband, Camille Monet, Claude Monet's first wife, can be seen here with their first son, Jean. This image contains the classic elements that Monet loved and constantly interpreted: warm daylight, flurry of colors, and the cooling contrast of shadows. Monet eventually stopped doing human studies and focused on landscapes because, "In the beginning I had no money, and models are very expensive. So I turned to painting models that cost nothing, and I have stayed with them with a passion." Throughout his career, Monet chose his intimate family members as models, lending an intimacy and affection to the humans that people his canvases. 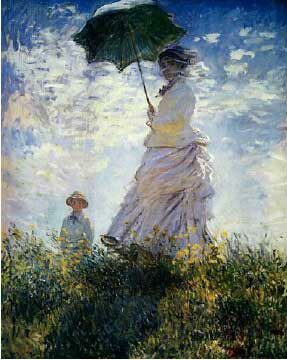 Search for Monet art prints and art by other artists. Site design, text and images © Copyright 2010 - Goldensight, Inc. All rights reserved.